Hydrogen Peroxide 40% (Eskata) for Seborrheic Keratoses | The Medical Letter, Inc.
STANDARD TREATMENT — SKs are benign, usually pigmented skin growths with a wart-like appearance that occur in about 83 million people in the US, primarily middle-aged and older adults.1 They generally do not require treatment, but patients may want them removed for cosmetic reasons or because they have become irritated.2 Cryotherapy with liquid nitrogen is the most common method for removing SKs. It can cause mild pain, scarring, and hyper- or hypopigmentation (pigmentary changes are more common in patients with dark skin). Curettage, shave excision, electrocautery, and laser treatment are also used to remove SKs. CLINICAL STUDIES — FDA approval of Eskata was based on the results of two double-blind, vehicle-controlled trials in a total of 937 patients, 98% of whom were Caucasian.4 Patients who had 4 SKs with at least one on the face and at least one on the trunk or extremities were randomized to receive a single treatment with hydrogen peroxide 40% or its vehicle alone. After 3 weeks, lesions that had not cleared, based on the Physician's Lesion Assessment (PLA) scale, were retreated; 97% of patients required retreatment. The primary efficacy endpoint was the percentage of patients with all 4 lesions graded clear on the PLA scale after 106 days. In the two studies, all 4 lesions were graded clear in 4% and 8% of patients treated with the active drug (see Table 1). A secondary endpoint was the percentage of patients with ≥3 lesions graded clear; in the two studies, ≥3 lesions were graded clear in 13% and 23% of patients. No patients treated with the vehicle alone achieved clearance of ≥3 lesions. Lesions on the face were more likely to be cleared than those on the trunk or extremities, and thin lesions were more likely to be cleared than thick lesions. ADVERSE EFFECTS — Adverse effects associated with application of hydrogen peroxide 40% in clinical trials were primarily local and mild to moderate in severity. The most common were erythema (98%), stinging (93%), edema (85%), pruritus (32%), and vesiculation (18%). One week after treatment, the most common local adverse reactions were scaling (72%), crusting (67%), erythema (66%), pruritus (18%), erosion (9%), and ulceration (4%). After 15 weeks, the most common local reactions were erythema (21%), hyperpigmentation (18%), scaling (16%), crusting (12%), and hypopigmentation (7%). Scarring was reported in 3% of patients in the two pivotal trials. Eyelid edema and herpes zoster each occurred in 0.6% of patients treated with the drug. PREGNANCY AND LACTATION — Hydrogen peroxide applied topically is not absorbed systemically. Application of Eskata is not expected to result in any exposure of the unborn fetus or the breastfeeding infant to the drug. DOSAGE AND ADMINISTRATION — Eskata should be administered by a healthcare provider. It is supplied as a prefilled, single-use applicator pen containing a glass ampule that must be crushed (by squeezing the pen) to release the drug into the applicator tip immediately before treatment. The applicator tip is pressed directly onto each SK with a circular motion for about 20 seconds until the lesion is wet; this procedure is repeated until each lesion receives 4 applications of Eskata at 1-minute intervals. Excess solution should be removed from surrounding skin using an absorbent wipe. All application sites should be dry before the patient leaves the office. Treated areas should not be covered, and topical products such as makeup or sunscreen should not be used for at least 6 hours. After 3 weeks, if the SKs have not cleared completely and treated skin has healed from any local reactions, Eskata can be reapplied; most patients have required a second treatment. The solution should not be applied to open or infected SKs. It should also not be applied within the orbital rim; direct contact with the eye can cause corneal injury (erosion, ulceration, perforation, scarring), chemical conjunctivitis, severe pain, and permanent injury including blindness. Any accidental contact with the eye should be treated with immediate flushing with water for 15-30 minutes and further monitoring and evaluation as needed. CONCLUSION — Eskata, a 40% hydrogen peroxide topical solution, is the first FDA-approved drug for treatment of seborrheic keratoses. Administration of the drug may be tedious and usually requires at least two office visits. It has limited effectiveness and has not been shown to have fewer adverse cosmetic effects than standard procedures for removing these benign lesions. GC Ranasinghe and AJ Friedman. Managing seborrheic keratoses: evolving strategies for optimizing patient outcomes. J Drugs Dermatol 2017; 16:1064. JM Jackson et al. Current understanding of seborrheic keratosis: prevalence, etiology, clinical presentation, diagnosis, and management. J Drugs Dermatol 2015; 14:1119. JC DuBois et al. A-101, a proprietary topical formulation of high-concentration hydrogen peroxide solution: a randomized, double-blind, vehicle-controlled, parallel group study of the dose–response profile in subjects with seborrheic keratosis of the face. Dermatol Surg 2018; 44:330. LS Baumann et al. 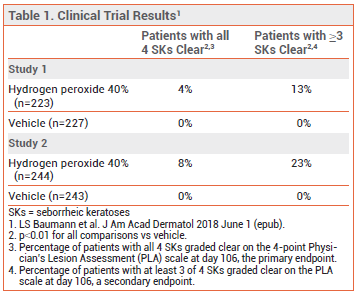 Safety and efficacy of hydrogen peroxide topical solution, 40% (w/w) in patients with seborrheic keratoses: results from two identical, randomized, double-blind, placebo-controlled, phase 3 studies (A-101-SEBK-301/302). J Am Acad Dermatol 2018 June 1 (epub). Approximate WAC. WAC = wholesaler acquisition cost, or manufacturer's published price to wholesalers; WAC represents published catalogue or list prices and may not represent an actual transactional price. Source: AnalySource® Monthly. September 5, 2018. Reprinted with permission by First Databank, Inc. All rights reserved. ©2018. www.fdbhealth.com/policies/drug-pricing-policy.